Kegel8’s Winning Evening at the Medilink Business Healthcare Awards! We're celebrating our success this morning in the Kegel8 office, after winning the University of Sheffield Innovation Centres Start-Up Award at the Medilink Business Healthcare Awards yesterday evening in the magnificent Cutlers' Hall in Sheffield! The specialist health organisation Medilink Yorkshire & Humber supports health technology and life sciences businesses like us at Kegel8. They help to guide us through the complex world of health product innovation so that we can grow our businesses and get our inventions out to as many people as possible who can really benefit from them. 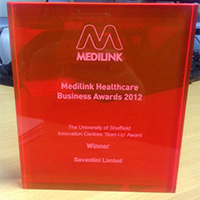 Each year Medilink recognises outstanding achievements in Healthcare Business. We traveled to Sheffield and soaked up the stunning surroundings of Cutlers' Hall, a beautiful Grade II listed building that was just perfect for the ceremony. There were five awards in total: the Medipex Award for Partnership with the NHS, the Creative Sheffield Outstanding Achievement Award, The UKTI Award for Export Achievement, the University of Sheffield Healthcare Gateway Innovation Award and the University of Sheffield Innovation Centres Start-Up Award - the award we were shortlisted for. And we won! It was such an honour just to be shortlisted, but we were over the moon to collect our award. It's wonderful that the Kegel8 has been recognised as such an important and influential product. So many women have already thanked us for helping them to make their pelvic floor strong, but winning at Medilink will only help to spread the word to even more women about the power of Kegel8-ing. Plus, winning at the Yorkshire & Humber awards means we're automatically shortlisted for the National finals in London in March. Keep your fingers crossed; it won't be long before Kegel8 takes over the world!